The Enhanced PWM (EPWM) function is similar to the standard PWM but with many added features. The EPWM is available on devices with the ECCP peripheral. The enhanced PWM mode generates a Pulse-Width Modulation (PWM) signal on up to four different output pins with up to 10 bits of resolution. To select an Enhanced PWM Output mode, the PxM bits of the CCPxCON register must be configured appropriately. The PWM outputs are multiplexed with I/O pins and are designated PxA, PxB, PxC and PxD. 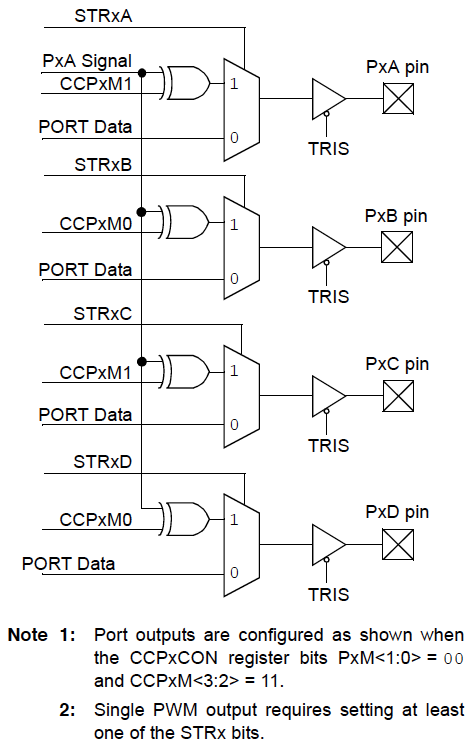 The polarity of the PWM pins is configurable and is selected by setting the CCPxM bits in the CCPxCON register appropriately. When any of the EPWM modes are used, the application hardware must use the proper external pull-up and/or pull-down resistors on the PWM output pins for additional current drive. The CCPxM<1:0> bits of the CCPxCON register allow the user to choose whether the PWM output signals are active-high or active-low for each pair of PWM output pins (PxA/PxC and PxB/PxD). 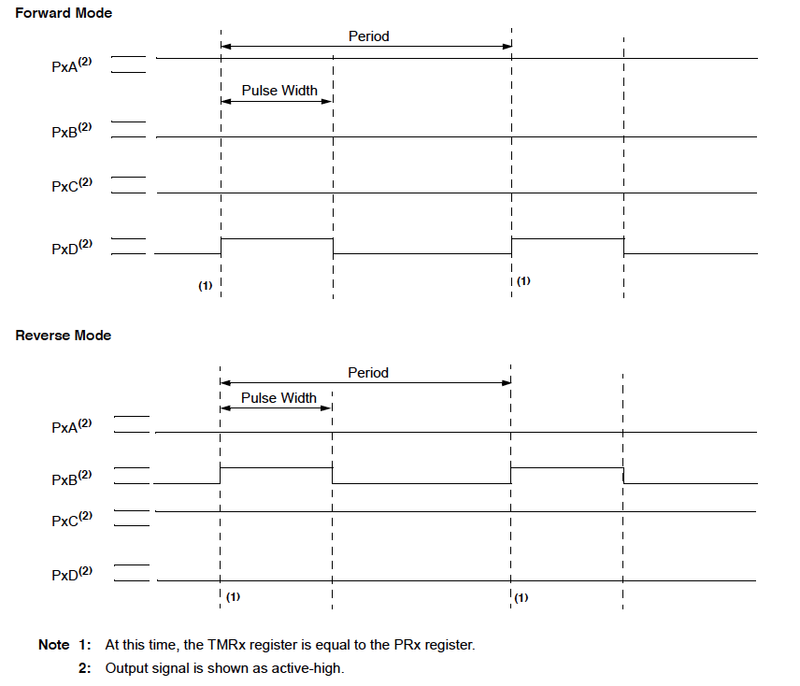 The PWM output polarities must be selected before the PWM pin output drivers are enabled. Changing the polarity configuration while the PWM pin output drivers are enabled is not recommended since it may result in damage to the application circuits. The PxA, PxB, PxC and PxD output latches may not be in the proper states when the EPWM module is initialized. Enabling the PWM pin output drivers at the same time as the EPWM modes may cause damage to the application circuit. pin output drivers. The completion of a full PWM cycle can be determined by monitoring the overflow bit for the timer selected to control the EPWM module. 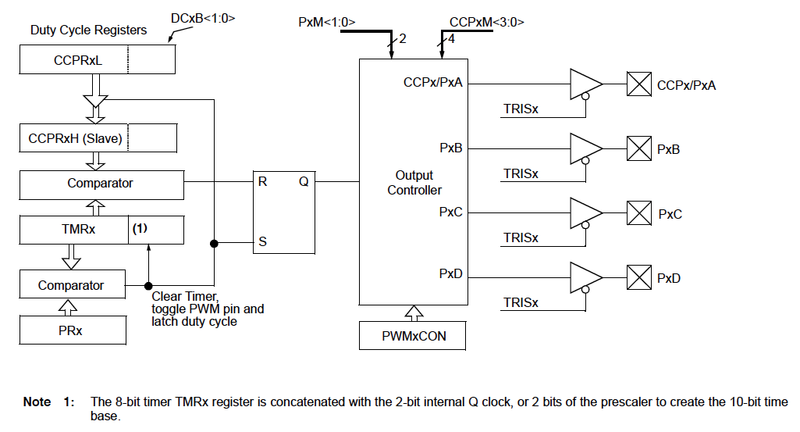 This timer overflow (TMRxIF) bit is located in the Peripheral interrupt register (PIRx). The TMRxIF flag will be set as the second PWM period begins. The software design must configure the PWM I/O pin as an output by clearing the associated TRIS bit. Also, on some newer devices, the PWM I/O pin function can be moved to alternative pins using the APFCON0 or APFCON1 registers or through the Peripheral Pin Select feature. Half-Bridge mode is an option for Enhanced PWM. 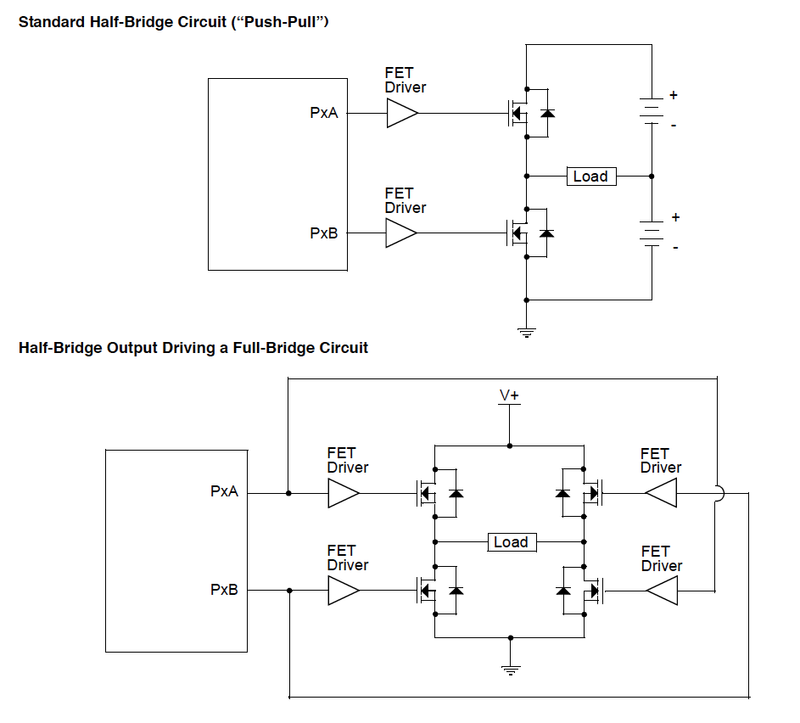 In Half-Bridge mode, two ECCP pins are used as outputs to drive push-pull loads. The Enhanced PWM output signal is output on two I/O pins: the PxA pin and the PxB pin. The PxA pin will output one PWM signal while the complementary PWM output signal is output on the PxB pin. The Enhanced PWM will handle the timing of the two alternating PWM signals to drive an H-Bridge arrangement or Full-Bridge, where four power switches are being modulated with two PWM signals. 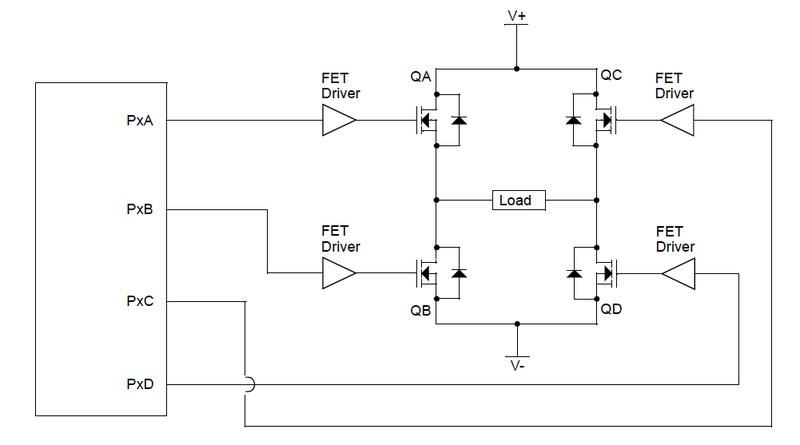 In Half-Bridge mode, the Enhanced PWM dead-band delay can be used to prevent shoot-through or direct short circuit paths of current in Half-Bridge arrangements. The PxA and PxB outputs are multiplexed standard digital I/O pins and need to be setup as outputs to drive the PWM signal. This is down by clearing the associated bit in the TRIS register. In Half-Bridge or Full-Bridge Enhanced PWM applications, if both the upper and lower power circuits are switched at the same time (one turned on, and the other turned off), due to delay in the circuitry, both switches may be on for a short period of time. During this brief interval, a very high current (shoot through current) will flow through both power switches, shorting the bridge supply. 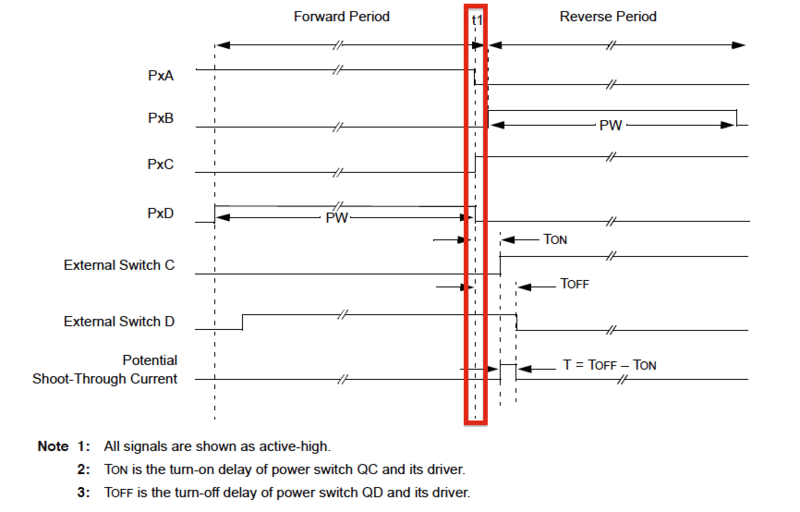 To avoid this potentially destructive shoot-through current from flowing during switching, Dead-Band Delay can be implemented to allow one current path to completely turn off before the other current path is turned on. The delay occurs at the signal transition from the non-active state to the active state and the delay is adjustable. The lower seven bits of the associated PWMxCON register set the delay period in units of instruction clock cycles (Fosc/4). For example, a device running at 4 Mhz will have a 1 Mhz instruction clock or 1 microsecond period. Therefore the value in the PWMxCON register will create a delay between pulses in increments of 1 microsecond. 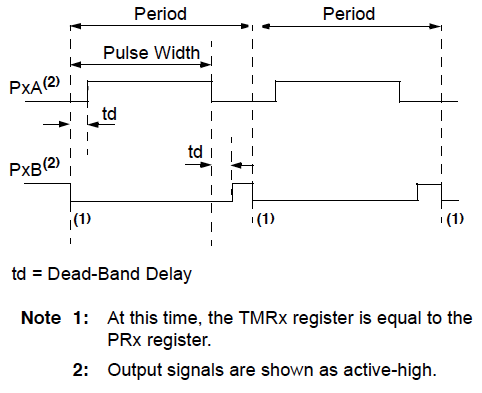 The image below shows the Dead-Band Delay graphically as the value td. When the Enhanced PWM is configured for Full-Bridge mode, four I/O pins are used as PWM outputs. This allows both forward and reverse control of the current through the load, typically a motor. The PxA, PxB, PxC and PxD I/O pins will be driven as outputs and are multiplexed with digital I/O pins. Therefore, the associated TRIS bits must be cleared to configure the PxA, PxB, PxC and PxD pins as outputs. The PxM1 bit in the CCPxCON register controls the forward/reverse direction. When the application firmware changes this direction control bit, the module will change to the new direction on the next PWM cycle. In the Forward direction mode, the pin PxA is driven to its active state, and the pin PxD is modulated, while PxB and PxC will be driven to their inactive state. In the Reverse direction mode, PxC is driven to its active state and the pin PxB is modulated, while PxA and PxD will be driven to their inactive state. The modulated outputs (PxB and PxD) are placed in their inactive state. The associated unmodulated outputs (PxA and PxC) are switched to drive in the opposite direction. PWM modulation resumes at the beginning of the next period. 1. The direction of the PWM output changes when the duty cycle of the output is at or near 100%. 2. The turn-off time of the power switch, including the power device and driver circuit, is greater than the turn-on time. In the 100% duty cycle waveforms below, at time t1, the output PxA and PxD become inactive, while at the same time output PxC becomes active. This can cause a short period of shoot-through current. 1. Reduce PWM duty cycle for one PWM period before changing directions. 2. Use switch drivers that can drive the switches off faster than they can drive them on. The Enhanced PWM mode supports Auto-Shutdown mode and Auto-Restart mode. A shutdown condition is indicated by the CCPxASE (Auto-Shutdown Event Status) bit of the CCPxAS register. If the bit is a ‘0’, the PWM pins are operating normally. If the bit is a ‘1’, the PWM outputs are in the shutdown state. 1) The CCPxASE bit is set to ‘1’. The CCPxASE will remain set until cleared in firmware or an auto-restart occurs. In the Figure 1 waveform plot above, the Shut-Down occurs at the "Shutdown Event Occurs" label. This is caused by the Comparator Output going to a high state. The Enhanced PWM can be configured to automatically restart the PWM signal once the auto-shutdown condition has been removed. Auto-restart is enabled by setting the PxRSEN bit in the PWMxCON register. If auto-restart is enabled, the CCPxASE bit will remain set as long as the auto-shutdown condition is active. When the auto-shutdown condition is removed, the CCPxASE bit will be cleared via hardware and normal operation will resume. This can be seen in Figure 1 above where the "PWM Resumes" label is shown. 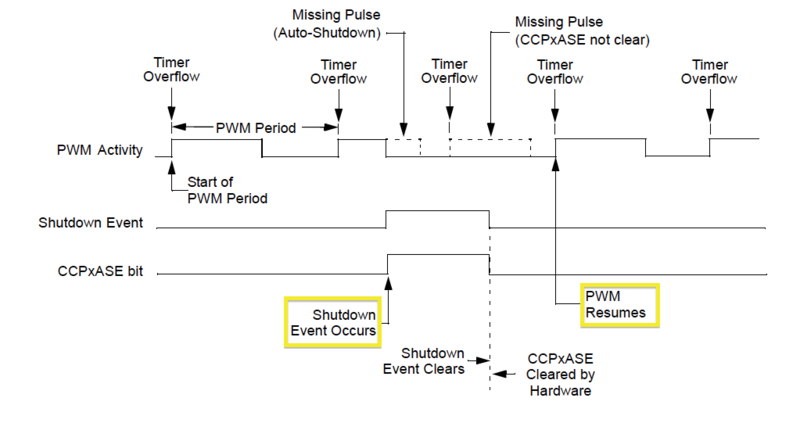 The Auto-Restart actually occurs right after the CCPxASE is cleared but the PWM waveform cannot start until a full pulse can be released. When the Enhanced PWM is enabled in single output mode, the PxA I/O pin will drive the pulse width modulated signal. However, that can be directed to other PWM I/O pins through the Steering Mode option. PWM steering allows any of the PWM pins to be set as a the modulated signal. Additionally, the same PWM signal can be simultaneously available on multiple PWM pins. The PWM auto-shutdown option works on all the enabled PWM I/O pins. The Single Output mode is selected by the PxM<1:0> bits in the CCPxCON register. The module has to also be in the EPWM mode which is any of the Enhanced PWM mode selections in the CCPxCON register. Routing a PWM signal to a different I/O pin, or more than one I/O pin, can be accomplished with the PWM Steering option. By setting the associated bit for each PWM I/O pin in the PSTRxCON register, the PWM output can be directed to the specific I/O pin. The Enhanced PWM Steering can control when the PWM signal will update via the Synchronization settings. The STRxSYNC bit of the PSTRxCON register provides the user two options for when the steering event will occur. When the STRxSYNC bit is ‘0’, the steering event will happen at the end of the instruction that writes to the PSTRxCON register. In this case the output signal at the Px<D:A> pins may be an incomplete PWM waveform. This operation is useful when the user firmware needs to immediately remove a PWM signal from the pin. When the STRxSYNC bit is ‘1’, the effective steering update will happen at the beginning of the next PWM period. In this case steering ON/OFF of the PWM output will always produce a complete PWM waveform.